Yesterday was The Tampa Bay Frogman Swim. I was once again happy and honored to accompany my friend Dobe on his 5k journey across Old Tampa Bay. It was cold; the water was cold enough for the Athletic Trainer in me to order an ice bath. Dobe has some issues generating enough heat to keep his entire body warm so he was insulated with extra layers of neoprene…two booties, a leg sleeve, a wetsuit, a hoody, a cap. His promise for the day: to start. We would abandon the effort if the cold got the better of him. After all, he had nothing to prove. 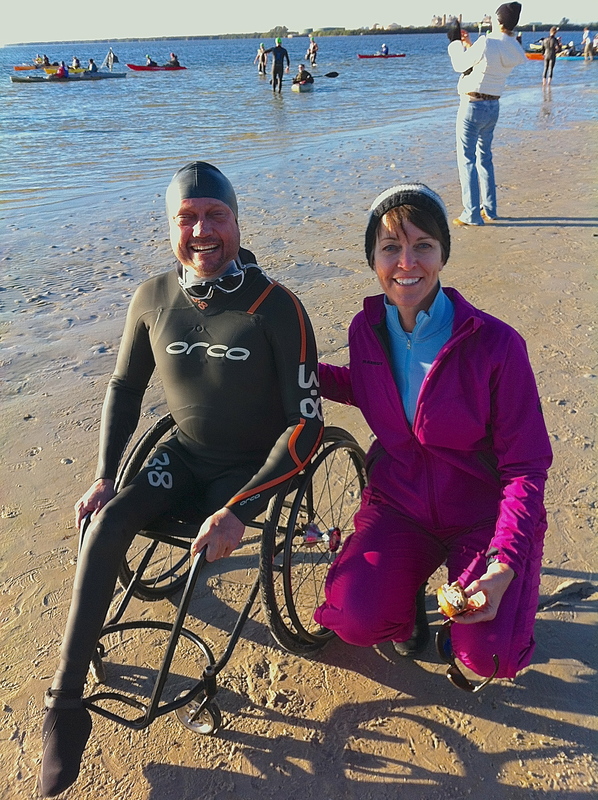 He had a successful swim in 2013 and funds in the bank for the Navy SEAL Foundation. Keep your eye on the prize. Get to the yellow buoy that signals the turn to cross the bay. The crowd from wave six spread out; we were relatively alone with the lapping of waves. Keep your eye on the prize. Dobe caught two swimmers, passed them. I don’t even know if he saw any of this. I had to keep my nose, my bow, and my intentions in the right direction as this would be all he was siting. Keep your eye on the prize. Dobe asked me watch his stroke, making adjustments if he got sloppy or lazy or inefficient. The race director compelled us to watch for signs of hypothermia. Dobe’s stroke remained constant, strong, rhythmic, long, steady. Keep your eye on the prize. The yellow buoy signaled the sharp right we were to take to head up the shoreline to the finish. The final orange float, a sharp left…the prize was only a few strokes away. Dobe’s buddies would come assist him to the beach, through the finish line, accept the medal. Since 1962 the Navy SEALs have served our country with the “unflinching comittment to accomplish (their) mission”. The Frogman Swim is a sold-out event in it’s 5th year. Perhaps if the money was going to a powder-puff football team, the length of the swim would have been shorter. If the funds were being distributed to the local band, it would have been canceled due to cold. Perhaps if we lived somewhere other than Tampa Bay and MacDill AFB nobody would be around to even dream up such a stunt. And perhaps if Dobe had never been faced with adversity he would never understand why you accomplish a mission. I am proud and honored to call Dobe my friend. I am stronger today because of his willingness to keep his eye on the prize. Starting line. Dobe in layers of neoprene, me in can’t-miss-seeing-me pink! This entry was posted in Swim, Uncategorized and tagged Navy SEAL Foundation, swimming, Tampa Bay Frogman Swim, the journey. Bookmark the permalink. 2 Responses to Keep your eye on the prize. 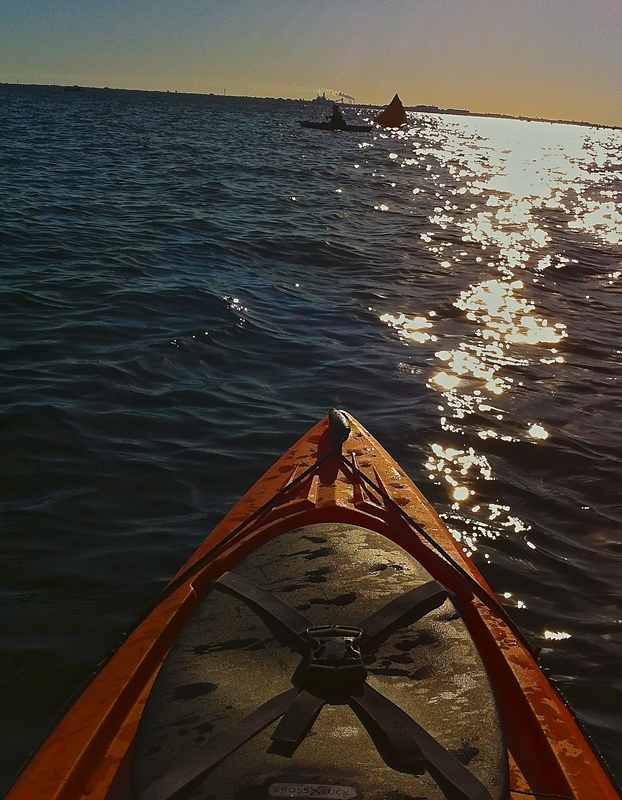 I was at the end, packing up the kayak for the ride back to Gandy. I could see the last swimmer coming in. Two guys started wading out to the finish. The applause started quietly but grew louder and louder as the swimmer came in. I didn’t know who it was, but when the lifted him from the water a tear came to my eye. This is what it is all about. People going beyond their expectations for a great cause. Thanks, Bob. 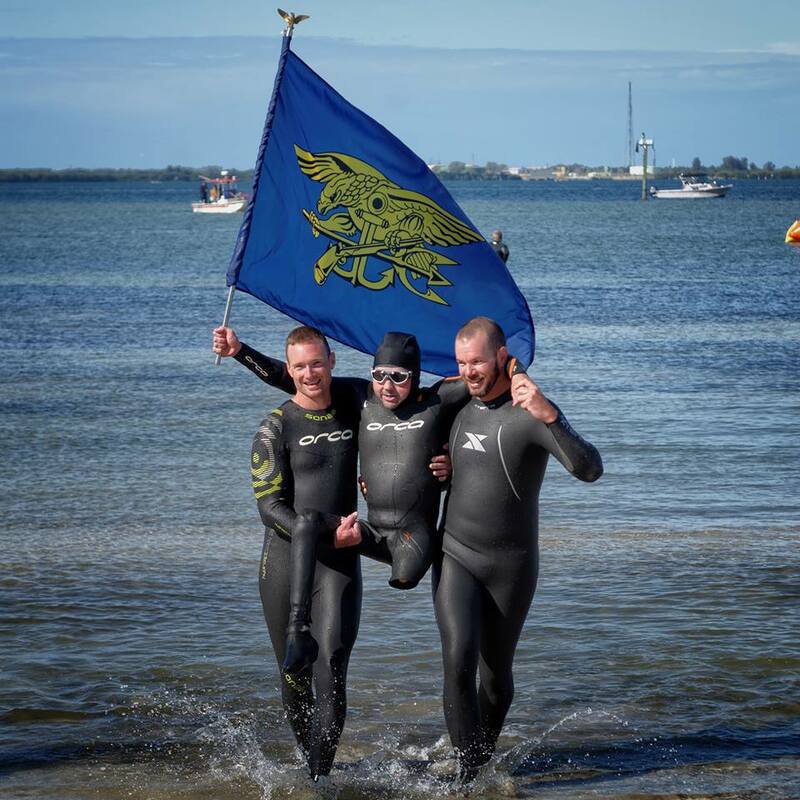 Each year the Frogman Swim exceeds expectations…because the people involved keep upping the ante. So glad you and I could help in their efforts!